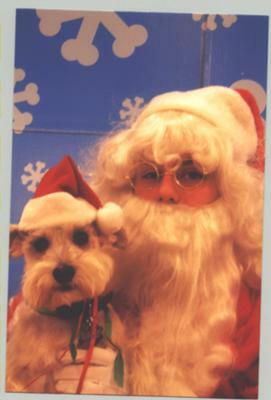 Check out this photo of me with Santa for the utter humiliation of a handsome manly schnauzer like myself. My Mom made me wear this silly Santa hat and jacket when she knows I do not like wearing clothes. Oh well, the best part of the day was that my human brother came too but he did not get in the photo, not sure why. i love this! i would totally do this if it was offered where i live!! i have prof photos of my baby! but i doubt theyd let me have a pic with santa! thats sooo cute!!! I saw santapaws also last year!! !